Welcome to my weekly fashion blog post. Each week I will discuss a female garment, fashion trend or influencer from the age of photography (1840s through the 20th century). My goal is to educate family researchers and genealogists about the clothing worn by our ancestors. Dating photographs is an issue we all struggle with as family archivists. Additionally, anyone who writes about their family’s history should be aware of the environment in which their ancestors lived. Period clothing is an important part of that environment from how it affects a person’s movement to their overall lifestyle. This week I introduce you to the Bolero and Zouave jackets. A Dictionary of Costume and Fashion: Historic and Modern describes the Bolero jacket as a “short jacket no longer than normal waistline, with or without sleeves. Worn open in front over bodice or blouse. Spanish in origin.” In comparison, the Zouave jacket is described as a “woman’s short jacket with rounded front, made in imitation of [the] jacket of [the] Zouave uniform. Sometimes sleeveless.” The descriptions of the two types of jackets are quite similar. For this post it is not important to know the subtle differences between the two styles but rather that the style of jacket was popular during the Civil War years. One of the reasons behind the popularity was the use of a Zouave style jacket in many volunteer units. The French Zouaves were an elite military force during the nineteenth century. Because the Civil War was an overwhelming influence on the lives of all Americans (including women), ladies’ fashion adopted some military characteristics, including the use of a Zouave style jacket. While the construction of the garment could be quite simple, existing examples of these garments show extensive embroidery and trimmings. 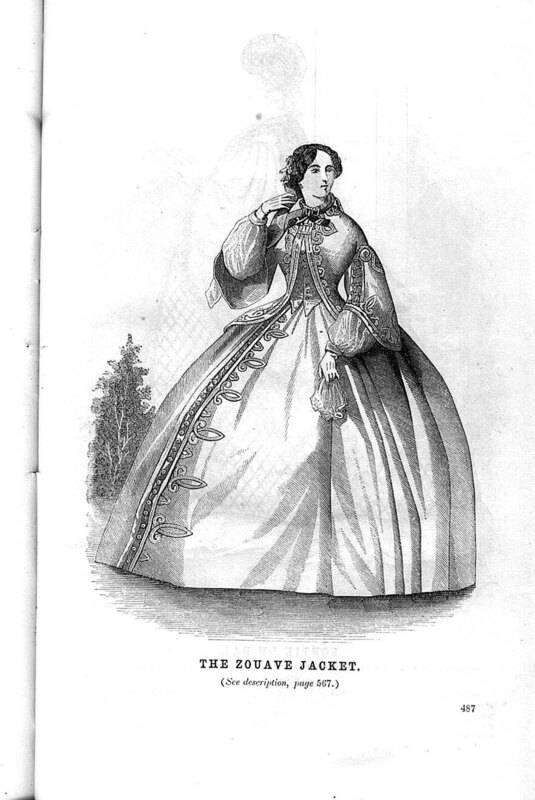 Many of the popular ladies’ magazines published fashion plates and patterns for Zouave jackets. Godey’s Lady’s magazine published many versions of the jacket, including this early one from 1859. Below are some plates and patterns from other periodicals of the day. The Library of Congress’ collection of Prints and Photographs has many examples of Zouave jackets, including these two photographs from between 1860-1865. Costume historian and technician, Quinn M. Burgess, wrote an excellent piece on her website about the Bolero and Zouave jackets. Brief article from the Smithsonian on the influence of the Zouave on Union and Confederate uniforms. The Newberry Library and the Terra Foundation have an online exhibit “Home Front: Daily Life in the Civil War North.” They briefly discuss the Zouave soldiers in the Civil War and their influence on fashion. Picken, Mary Brooks. A Dictionary of Costume and Fashion: Historic and Modern. Mineola, New York: Dover Publications, Inc. 1985. 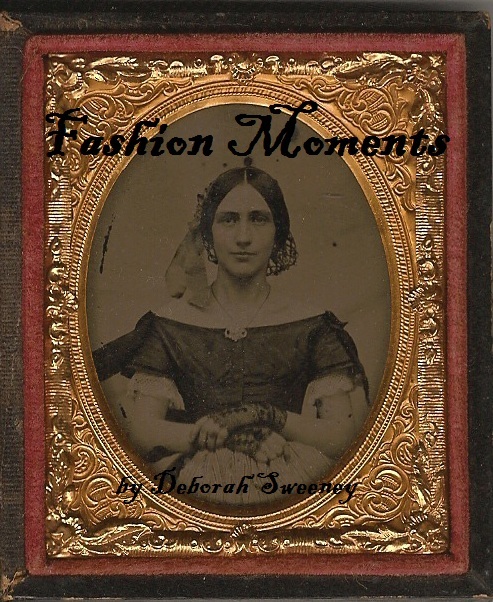 This entry was posted in Fashion Moments, Genealogy, Photography and tagged Bolero Jacket, Civil War fashion, dating photographs, fashion, genealogy, Photography, Zouave Jacket on September 6, 2015 by Deborah Sweeney. I find it interesting that, well before the era of TV and mass market magazines, people knew so much about what people far away and in such different contexts, were wearing. As I look at the illustrations of women in such voluminous dresses–so MUCH fabric–what does this tell us about their economic status? Poorer women, I would assume, just could not afford to have clothing like this. The resources that you direct people to are amazing! I am looking for middle aged immigrant women’s fashions from 1910. Can you point me to a good resource? Thank you for your question! My first response would be…it depends! What country did the immigrant come from? What was her economic status? Did she belong to a specific religious group? I would start with some of the Sears catalogs at Ancestry. The company offered good, basic clothing at a reasonable cost. The catalogs reflect the general styles of the time. Very informative! My great-great-great-grandmother wore a jacket like these for a photograph in 1867: http://homesteadgenealogy.com/2013/08/30/photograph-analysis-a-wedding-portrait/ Fun to see other examples! Great! I keep trying to think of fashions that were popular enough that people will have examples of them in their own photographs. I love to see everyone’s pictures!